Kleefeld on Comics: Where The Bloody Heck Did Annuals Come From Anyway? Where The Bloody Heck Did Annuals Come From Anyway? I was chatting with my friend Matt and we got to thinking about the concept of the Annual. Take a second to think about it. It's a comic book that's based off/tied to a regular ongoing series. But it only comes out once a year. And it's usually not directly tied to whatever is established in that main book -- either from a story or from a publication perspective. They also often do not feature the creative team of the main book. It's a separate entity unto itself, except that it's considered part of the regular comic. It's really kind of a bizarre quirk of the medium, if you think about it in those terms. So where did they come from? Well, Lew Stringer actually pulled some info together on this a few years ago. The predecessors date back to the 1820s with a children's Christmas book that came out towards the end of the year; it was called, appropriately enough, The Christmas Box. Half a century later, Chatterbox began as a weekly children's paper founded by John Erskine Clarke. Early on, they began also releasing a larger, hardcover version around Christmas and its popularity and longevity helped to solidify the notion as it was tied to a children's periodical. The first one with comics was The Playbox Annual from 1909 which featured comic strips like Tiger Tim. As comic books came into being and proved popular, comic annuals started to become a staple. The basic idea of an oversized book coming out towards the end of the year was consistent. Essentially, it was a marketing gimmick publishers used to get more money around the holidays, when people were more likely to spend it. As near as I can tell, this started to change somewhat in the late 1950s. Annuals seems to start coming out at all times throughout the year. 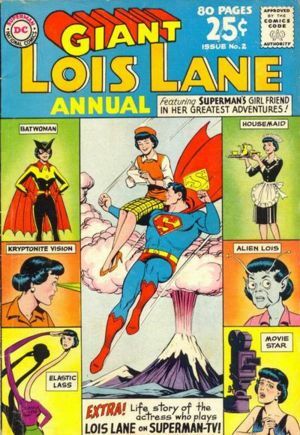 While Giant Lois Lane Annual #2 went on sale in June 1963, Giant Superman Annual #8 had an on-sale date of late November that year, GIant Superboy Annual #1 debuted in April 1964 and Giant Batman Annual #7 hit the streets in later in May. My guess -- given that all that all those titles are from the same publisher -- is that they were trying to pick up on the extra sales of an annual, but spread out all of their publications throughout the year. The thinking being that if ALL of their annuals came out at the same time, a child wouldn't have the cash available to afford all of them; whereas if they were spread out throughout the year, they might be able to purchase more. That's a bit of a guess on my part, though. I'm not sure if publisher were really thinking along those lines back in the 1950s and '60s. The other possibility that occurs to me is that, since the Christmas timing/theme was originally a British notion, it may well not have translated here in the States. American publishers may have just gotten the "put out one extra issue every year" idea, and not put any though towards what time of the year it should be published. It's interesting to note, too, that even after starting Annuals, publishers were not always consistent with them. Fantastic Four Annual first came out as a yearly book in 1963, but the were none published in 1972, 1974, 1975, 1982 or 1986. Presumably the lapses in '74 and '75 owed to the Giant-Size FF book that ran as a quarterly magazine for those two years, but I'm at a loss to explain the others. I can maybe see something in the 1980s where regular series creator John Byrne was to busy to do the Annuals himself, and no one felt it was appropriate or was allowed to have another team on the book? But that's a really a guess. And still wouldn't explain 1972. The notion of multiple Annuals being tied together as a cohesive story dates to the late 1980s, and one could make the argument that was the time when commercialism overtook storytelling; however, it should be reiterated that the very notion of Annuals came about as a blatant form of commercialism that owed more to filling publishers' coffers than providing quality entertainment. We just don't tie it as readily to Christmas any more. * It makes sense that annuals originated as a Christmas extra, though it's also odd since I've always thought of them as a "summer special" if anything, given the usual timing of the Marvel annuals as well as big annual-based events like Atlantis Attacks. * I had never noticed that the FF annuals missed years in the 70s and 80s. It always felt like there were too few annuals from Byrne, or even set during his years on the book, for as long as he was around... interesting to finally realize that this wasn't just my imagination or some quirk of scheduling. There really were too few.